Labor Day may have come and gone, but in many locations across the country, the temperatures and humidity haven’t heard the news. Fall might be right around the corner but there is still enough time to have that one last summer day out and about with your friends in your favorite summer clothes. So don’t put those shorts away just yet. We love the warm, sunny weather because it basically gives us unlimited potential throughout the day, right? You want to be outdoors and on the move, soaking up the heat and vibes all around you, taking in everything your town has to offer. 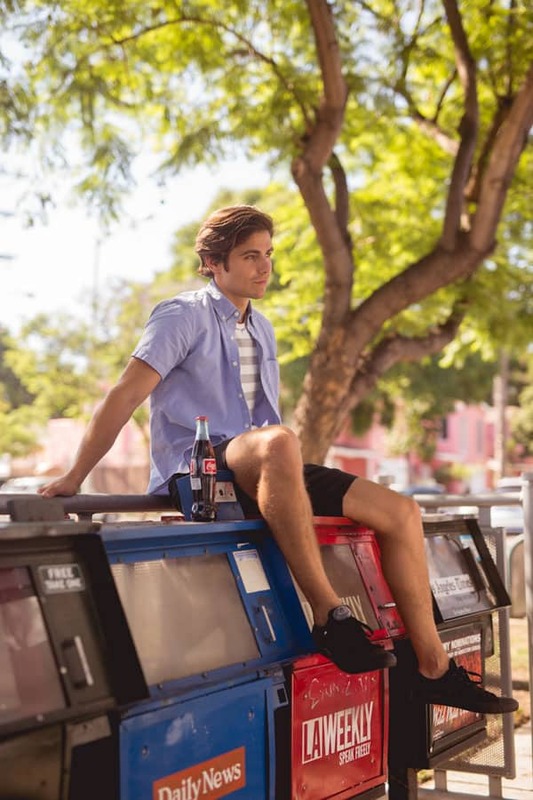 Whether it’s a walk to get some coffee with a friend in the morning, checking out an art gallery in the afternoon, or heading to a baseball game at night, you need a getup that is stylish, versatile, and balances hot afternoons with cool evenings. Because let’s face it, you never know where you might end up on a day like this. Get out and soak up that last bit of summer. How do you dress for a day of limitless options without looking out of place anywhere you might end up? Embrace style items that are equal parts casual and intentional. Let’s start from the bottom up with a pair of classic, all-black, low-top Converse Chuck Taylor All Stars, available here from Amazon for a modest $50. Converse has been a warm-weather staple for decades, but the all-black pair paired with black fitted shorts draws inspiration from Los Angeles skate culture and gives the ensemble an edge. The Goodthreads 9” Stretch Chino Short can be purchased on Amazon for $25 and is Prime eligible. The bottom half of the outfit is decidedly LA, which prevents it from being bland or generic. Up top, the preppy striped t-shirt and the short sleeve oxford cloth button down certainly help balance out the skate vibes. Just enough prep to balance out the punk, keeping it versatile for multiple venues. The blue oxford is a must for days and nights out in the summer weather. This particular option is on sale for $30 from Gap and works with just about anything, but we really like it paired with the black shorts and Converse. 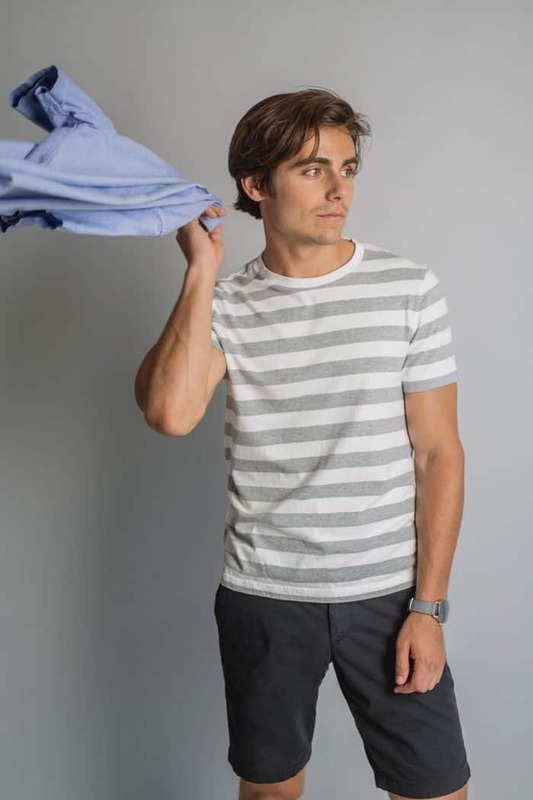 The horizontal striped tee breaks up the monotone elements of the outfit perfectly. This cotton t-shirt pictured is just $12 from Muji but we also like a similar option from J. Crew Mercantile on Amazon for $16.50. For more of our favorite pieces from the J. Crew and Amazon collaboration, check out our picks here. Add another splash of edge to the overall look with a simple, clean timepiece. 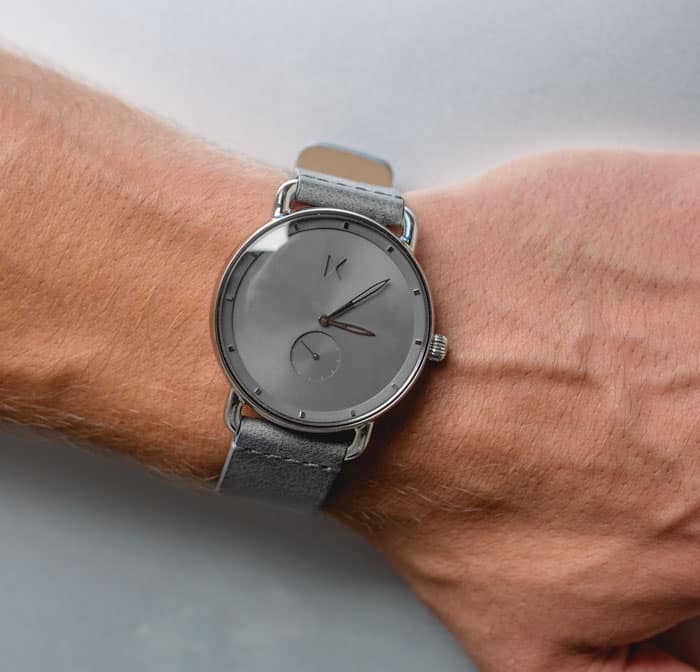 The minimalist cool of the MVMT Gotham watch ($140), with its solid gray face and gray leather band makes a clear contemporary statement. This outfit gives you just enough of a layered look while still keeping you cool and casual. The true layering, however, is just around the corner (Hint: Fall Getup Week is coming), so go out and enjoy the sun and the warm temps while you still can! What Is Your Go-To Late Summer Look? Share It Below! Stephen Albertini is a freelance writer covering sports, fashion, music and culture. His work has been featured on a variety of outlets, including Grailed, Complex, Bleacher Report and Primer. Love this Getup. Very much my style but need some help with something. I recently just bought a ton of clothes from J Crew and the Gap featured on here in XXL and got them yesterday and not one of them fit. I normally wear XXL and everything was tight. 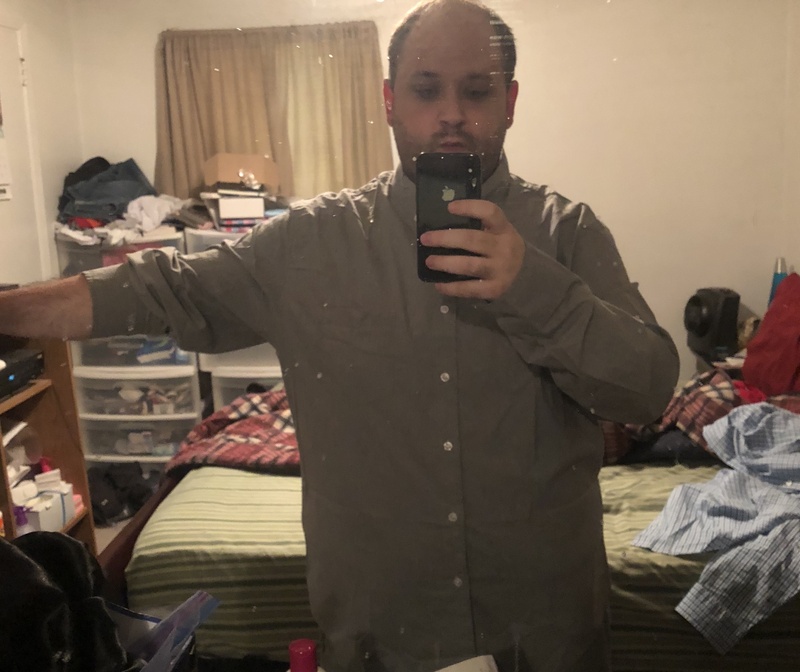 Would you recommend a XXXL? Can you recommend a good place to purchase clothes that are stylish but will fit a bigger guy? 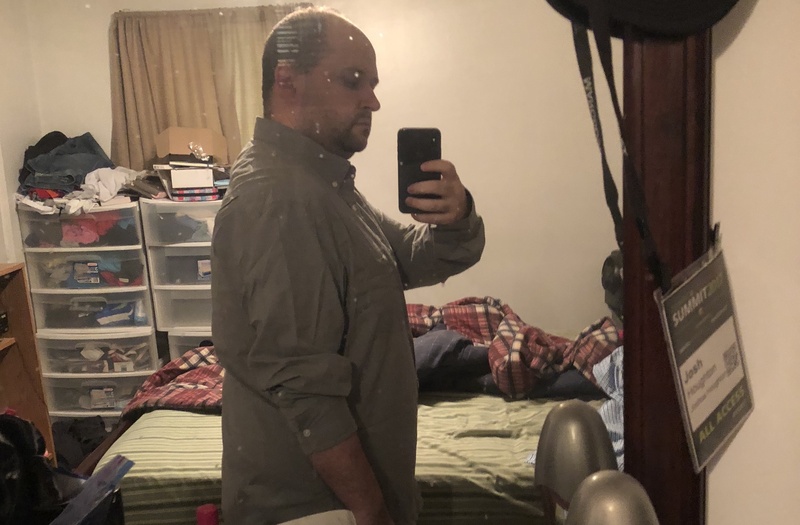 Currently 230, but am losing weight daily and working hard to hit 170, but will take time. In the meantime, really need some help to find some clothes that fit to wear to a resort in Mexico. 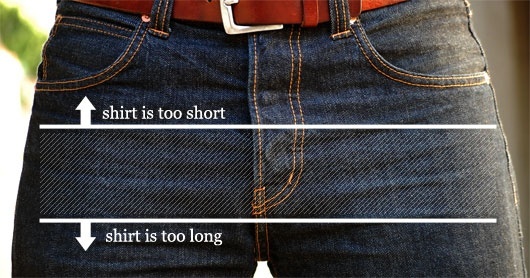 Seems like Gap and J Crew we’re not designed for bigger guys lol. These getups are super helpful tho. The shirts and styles I picked up looked amazing, but just didn’t fit. Any thoughts? Target now has a “Big and Tall” section. That would be a good start. Here is one of the shirts just for reference. Could it be I’m just used to baggy clothes? I dunno. Feels a little tight for me. My goal was to wear this with some chino shorts with the sleeves rolled up with either some Authenic White Vans or Boat Shoes in Mexico at a resort. Now the odd thing is I bought two other shirt which I’ve attached here as well as photos. I thought it was the same as the red one, but it fits much tighter around the stomach area. I have to pull the buttons a little. I just noticed it says “small” in the name for some reason even tho the tag says XXL? Confused. Here’s is the link to the shirt and I attached photos of me in it, the blue one. And then here is a link to the gray one and I also attached photos of me in it. Look forward to hearing your thoughts on these. Hearing stuff from experts like you gives me a lot more confidence in sizing and how things are supposed to fit. This is why Primer is the best! And since you think it actually fits well I will keep it 🙂 I assume as I lose even more weight it will fit even better. And then here is a polo I bought, but I believe this is way too small lol. Also have it in black color. I know the place that you are in. I’m a short guy who struggles with my weight. 5’7″ and 200 lbs is not ideal for fashion. Let’s talk about where you are based on what I see in your images. You have probably always felt challenged with style and felt you had to wear oversized baggy clothes to hide what you believed to be a flaw. So first of all, congratulations. You realize that you are not flawed at all and that you deserve to look great just as much as some chiseled guy does. And you do, you look great. This shirt is not too small at all. You just feel like it is because you are used to hiding yourself in way too much material. You look great in this shirt. The one you posted earlier, I have to agree with Andrew. If anything that one is too big. 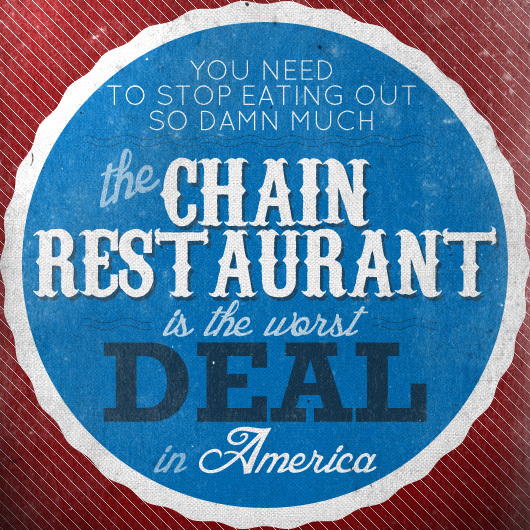 You probably could go down a size if you wanted and if you lose another 5 or so pounds that shirt will be obsolete. Buying clothes while losing weight is both a blessing and a curse. It’s tough because you plan to not be able to wear your current size for long but it is great because you can experiment with more looks. Spend a little less and figure out looks you really like so when you hit your target you know what to buy. The bottom line is, you look great. Fashion awareness is a great thing to have and it looks like you are well on your way. I’m proud of you and I can’t wait to see more updates in the future. You are amazing and you got this. Go kill them in Mexico. This is one of the most amazing Primer comments ever. Couldn’t agree more and so inspired by the support you’re offering. You guys are incredible. Dude! You’ve built an amazing website and a great community here. You and your team go beyond with everything here. If you’re ever in Georgia, drinks on me 🙂 I’m grateful for all the help. It’s nice to speak with someone who has experienced the same issues I’m going through at the moment. You’re correct! 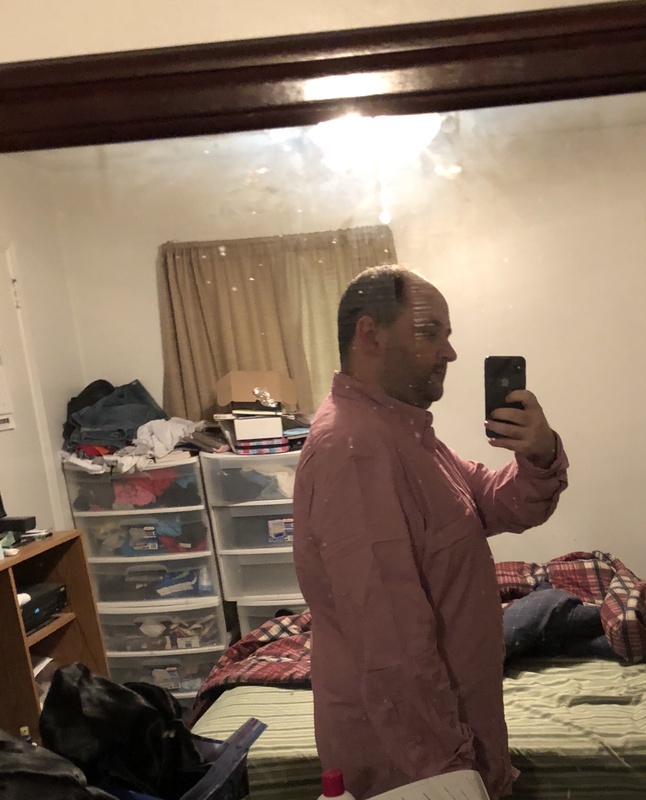 Due to my weight, my love handles and everything else I have always felt challenged with style and all of my clothes are pretty baggy and big. I used to be over 300 pounds so it’s been a journey with a lot of up’s and downs. And for a while I was looking at men fashion sites and hated most of it, but then found Primer and loved it. The content, the getups, all my style, very clean, causal and fun. The biggest problem I have is my body type obviously. My arms are really short, but I seem to have a long torso, at least from what my wife says. 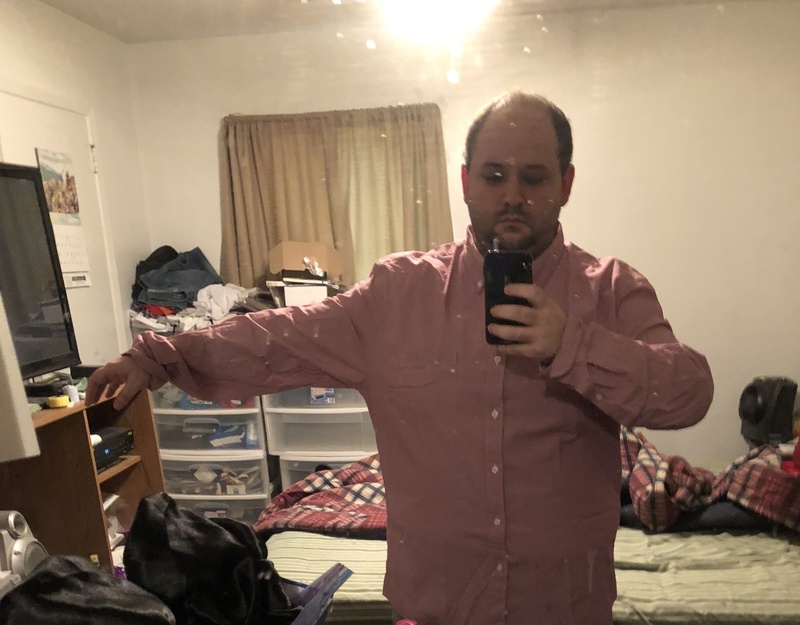 So when I buy shirts, the arms are always too long. 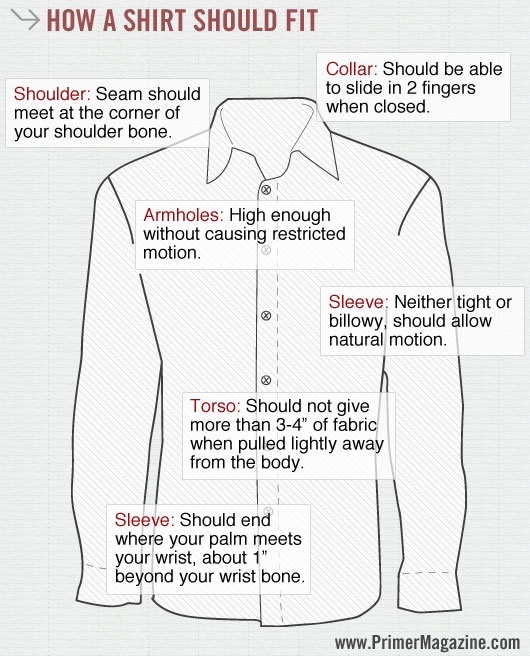 And for the shirts where the arm length is fine, the shirts barely, if not don’t fit at all. Funny you said that shirt isn’t small. When I looked at it and the fact that it feels gripping to my body abd you can see the outline of all my rolls and chest had me feeling it’s way too revealing and small. Interesting you said it’s not small as I feel like it’s skin tight. Awwww…that shirt, yes, the arms are really big. 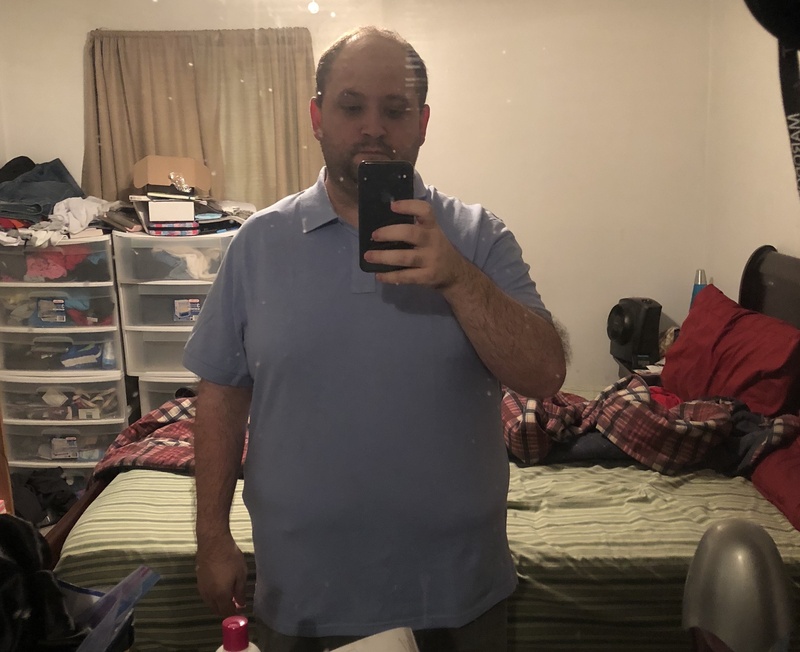 Crazy thing is, I bought a smaller size of that shirt and yes, the arms fit much better, but I couldn’t even button it. around the stomach. Literally! And yeah, it is a blessing and a curse. 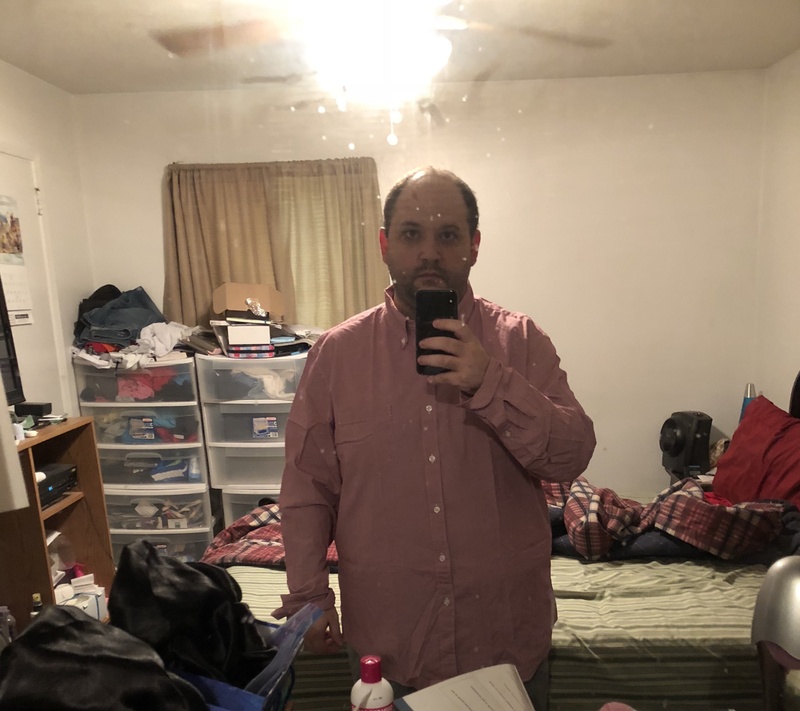 I do keto and lose weight rapidly, down another pound today and within a few weeks all the clothes I’ve bought will be obsolete. But I agree, it gives me ideas on what to wear. 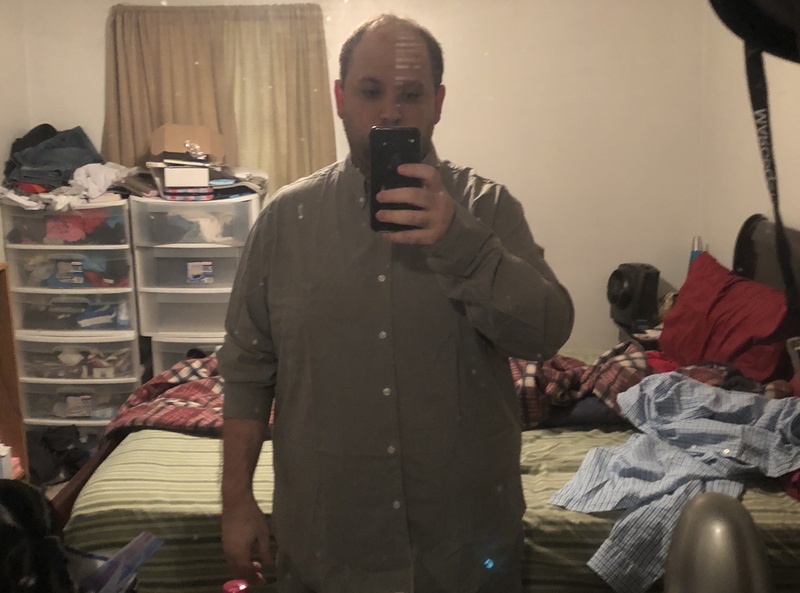 So I guess my biggest concern at the moment is, since anything lower than the size I have at the moment just won’t even button up, do I just stick with the current sizes which are still WAY better than the 3 and 4XL I used to wear. And as you see in that polo shirt, is it okay for my love handle outlines to show and such? Maybe a different color of shirt? Dude, Andrew and you have been awesome. I can’t thank you enough. 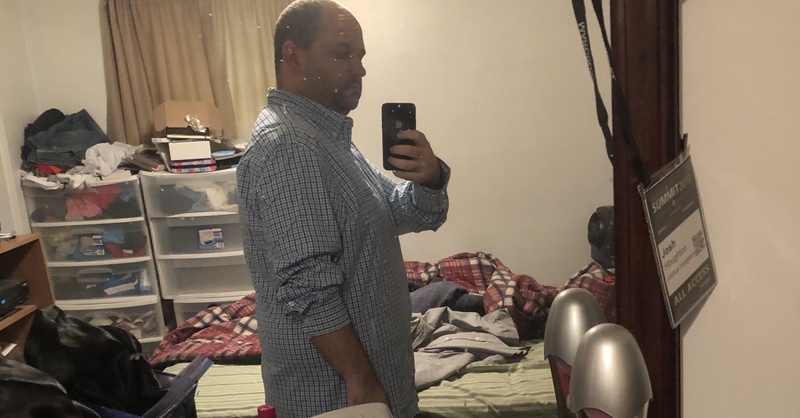 It’s my hope, that one day, I’ll be able to hit my goal weight of 170 and be able to present my own Getup to you guys! I leave Thursday for my Mexico networking trip. 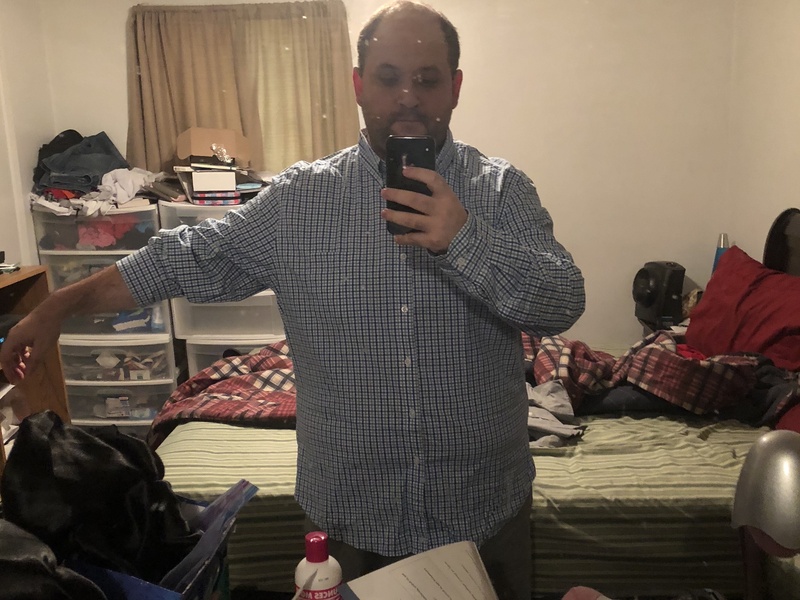 Right now, I purchased a ton of long sleeve shirts which I plan to roll up at the sleeves? 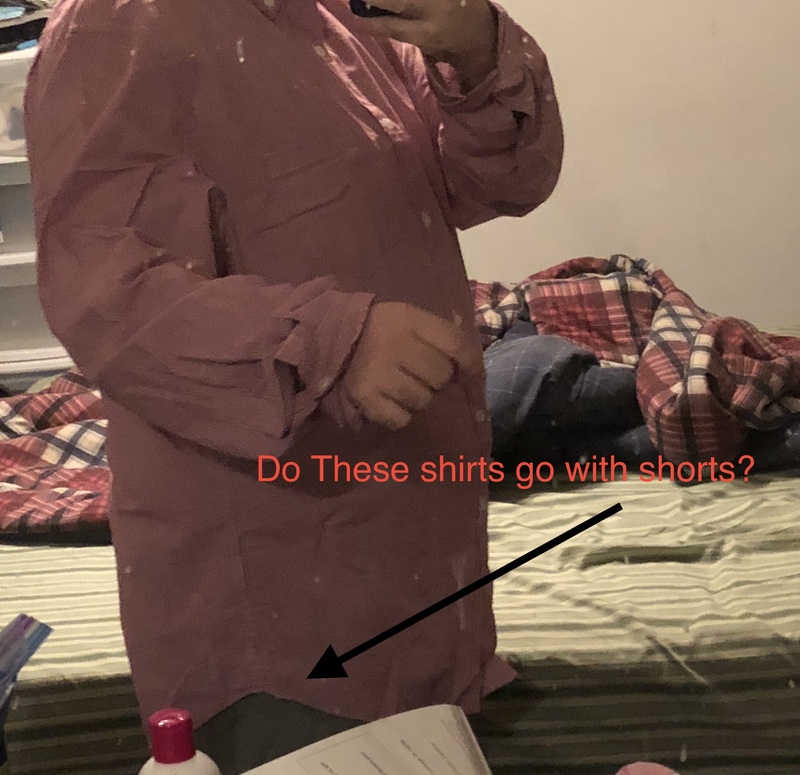 Can you recommend a good sleeve rollup technique that looks good with long sleeve shirts and shorts. Yesterday I bought a few St. John Bay polo’s and t-shirts, A Orieant Watch I’ve seen here, Sperry’s, Authethic Vans White’s and today going out for some shorts! UPDATE! So I’ve been trying on shorts all day. Different sizes and different brands from JC penny’s and no matter what all of the shorts go right below my knee. I think it had to do with my height. I wear a 40 size waist, 38 don’t fit even with the elastic waistbands. So struggling right now as everything goes below the knee and this is with all shorts sitting at my belly button? Hey Josh! You’re very welcome, so glad it’s helpful! The ‘small’ in the name of that shirt is referring to the ‘small gingham’ which is the pattern, attempting to communicate that it’s a small check shirt versus a shirt with large checks, it’s not referencing the fit of the shirt, but that is definitely confusing. 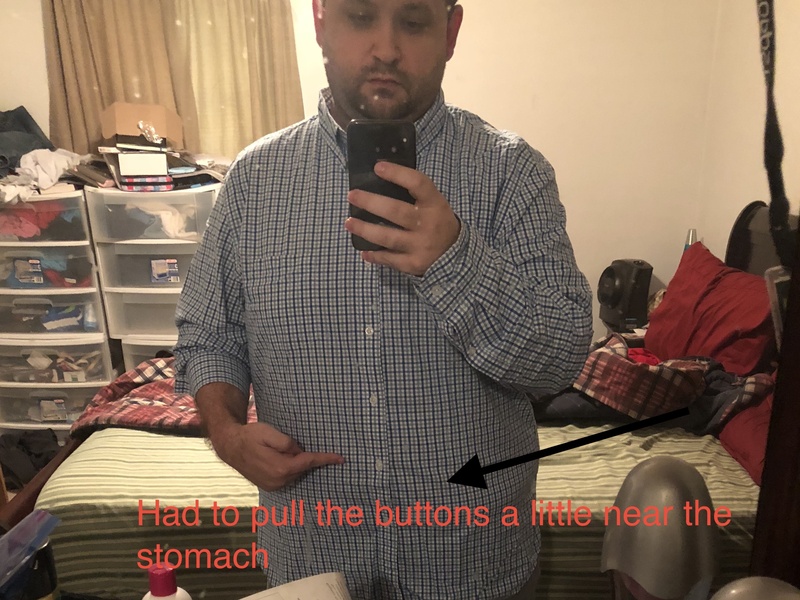 I think these shirts will work great, the part you noted where you thought the buttons were pulling is totally fine, it doesn’t look bad at all. For that you’re looking for where the buttons look clearly strained and the fabric around the button starts to pucker. From the photo it looks like it’s laying flat. Jumping off of John’s incredible comment below, I think these are totally wearable but for your next shirts I think you’re ready to size down! Nice work! Let me know if you have any questions, I’m excited for your Mexico trip! Thanks brother! Primer has been amazing and I’m learning so much. Went yesterday to buy some polo’s and today going to find some shorts. Using your visual guide as a reference, going to look for Chinos and Front flats. Any other styles you would recommend. Will be going to JC Penny’s and also checking out Old Navy which we just got here a few months ago. 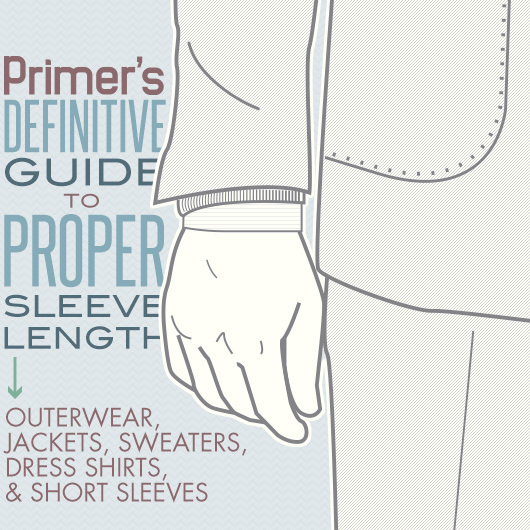 The proper sleeve length for outerwear, jackets, sweaters, dress shirts, and short sleeves. 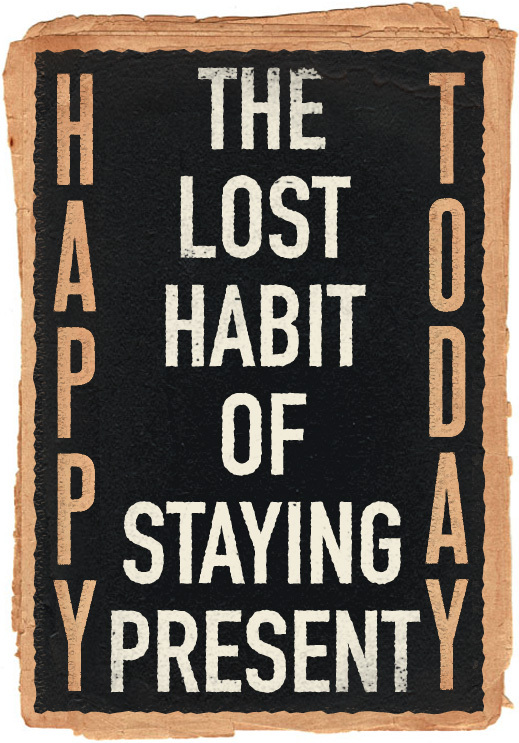 Focus on being happy, just for today. Then do it again tomorrow.